Keeping Your Eyes Safe: It’s Not Something to Play Around With! 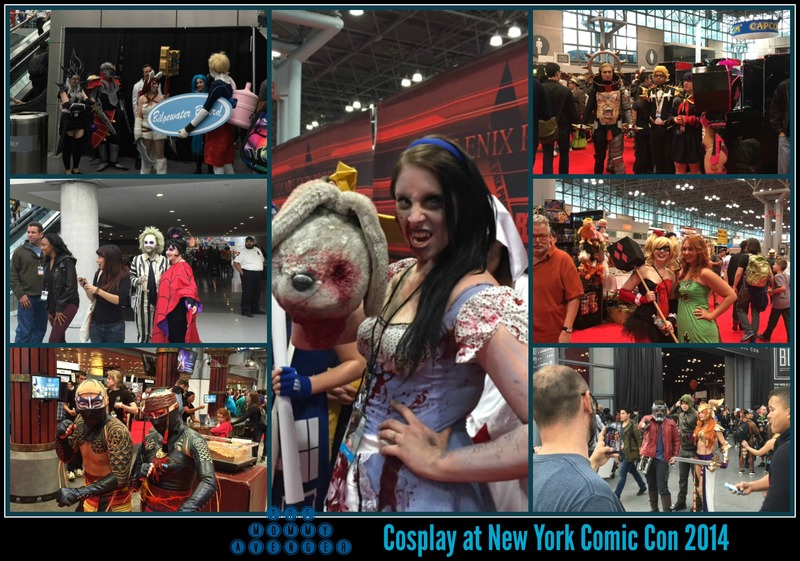 I spent the weekend at New York Comic Con, which was an experience unlike any other I have ever had. I was blown away at the costumes that people wore (also known as cosplay). It was incredible the lengths that people would go to have just the right costume. Really, there were some crazy extremes! It was like Halloween on steroids! Very entertaining, it was so much fun to see people’s expressions of the characters that they loved. Here’s some examples of what I saw. One trend, though, that I didn’t love were people using cosmetic contact lenses. They were everywhere! Yes, they look cool, but at the same time, this is a scary idea to put something that doesn’t serve a functional and medical purpose inside your eye! There were actual vendors selling a huge assortment of contact lenses, which really made me stop and think. Would I use something like that on my own eyes? Would I want my kids to wear them? The answers are no and a resounding no! I care far too much about the safety of my children’s eyes! What exactly are you putting in your eyes when you are inserting a cosmetic device in them? What if something were to happen to them that would damage their eyesight? Not worth the risk. So with that in mind, I wanted to share with you some helpful tips this time of year from Acuvue to help keep our eyes and those of our children healthy. Purchasing Contact Lenses: A contact lens is a medical device and in the United States, all contacts lenses, even purely cosmetic ones, require a prescription from an eye care professional. However, come the fall, many children, teenagers, and even adults begin to think about “who” or “what” they want to be for Halloween. And, a number of them are tempted to complete their look with decorative contact lenses bought without a prescription. 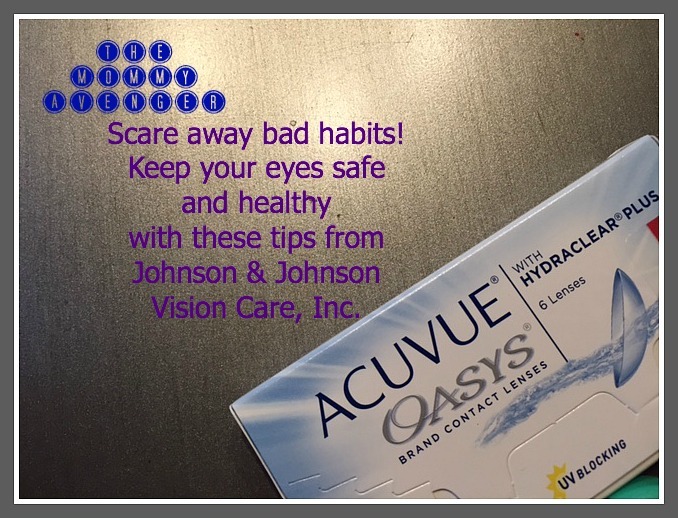 The Importance of Year-­‐Round Eye Care Hygiene: Johnson & Johnson Vision Care, Inc., manufacturer of ACUVUE® Brand Contact Lenses reminds us – especially teens – how important it is to practice safe contact lens wear and care – from obtaining contact lenses via a prescription from a licensed eye care professional, to practicing good hygiene habits when inserting/removing contact lenses as well as the importance of following wearing and replacement schedules, proper lens care, and disinfecting routines as directed by your eye care professional. The Statistics: Halloween isn’t the only time of year that people try contact lenses without a prescription. According to the American Optometric Association’s 2013 American Eye-­‐Q® consumer survey, 17 percent of Americans have worn decorative contact lenses that don’t provide vision correction as part of a costume or for other cosmetic purposes. Of those individuals, 24 percent purchased them without a prescription from a source other than an eye doctor. I think these are great tips and reminders for us to take into practice. I know I am guilty of stretching the life of my lenses a little too long or falling asleep with them in, when I should have taken them out. This isn’t something I want to carry over to my kids! As a mom, I want to make sure I am very diligent in making sure my son is doing all he needs to do to keep his gorgeous eyes healthy. My son has a super busy schedule, and so do I, so it can be a little too easy to slide on remembering to follow up with him to make sure he has taken his contacts out or performed the proper maintenance on them. So it’s really cool to me that Acuvue has an awesome tool called the Acuminder to help with that. My son (and I) can receive text messages to remind us when we need to change or reorder our contacts. This keeps us both in check and making sure that our contacts are fresh and performing to the best of their ability. Knowing what we do now, I know my son will make good choices when it comes to his eye health and will think twice about putting cosmetic lenses in his eyes. You can learn more about Acuvue lenses and Acuminder by visiting the Acuvue website. I have always wanted to try wearing contacts ( so I can see how I’d look like if I had gray eyes, lol ), but I am a bit hesitant because some of my friends say that it sometimes hurts. But, it looks like wearing contacts is a whole lot of fun – I see all these crazy-colored ones … I just want to try them. And maybe I will. I just have to say EW to wearing someone elses contact lenses. Do people actually do that? Since most of those lenses are probably not made by professional eyecare companies, I would be very, very hesitant to put them in my eyes. What I’d worry about most is lack of oxygen, I think. I wore contacts for a very long time, but love the look of glasses. My hubby uses them for skiing and snorkeling. You have to be ultra careful and clean when putting contacts in.. I cannot wear them, because they pop out of my eyes..
I’ve heard those kinds of contacts (the cosplay ones) are painful at best and quite harmful at worst. I would never use them myself. Hey, that’s my contact lens too! It can be quite pricey, my doc said it’s one of their high-end lenses. I chose it though because it’s comfortable, softer than other lenses. Btw, my daughter would be so scared if she saw those people doing Cosplay! I’m a contact lens user but it’s for aesthetic purpose only. I’ve seen Acuvue and I want to try the daily lenses, contact lens with designs are sometimes painful to the eyes. You’ve got some great tips there. I don’t wear contacts but know many that do. My daughter wanted these so so so much. I finally let her get thm, believing she’d wear them and forget about them. Thankfully that’s what happened. She wore them for not even 15 minutes and never wore them again. I got lucky. It’s not a chance I should have taken. My husband used to wear ones to change his eye color for Halloween. I’m glad he stopped wearing them. Some great tips here. Especially at this time of year when those who don’t normally wear contacts are purchasing them for their costumes. As an optometrist’s wife, I couldn’t agree more!! Protecting your eyes is a major priority! I tried cosmetic lenses once and they were so uncomfortable that I never did it again. These are great tips for people that like lenses. I’d also be worried about damaging my eyes since the people selling the lenses often aren’t medical professionals and they don’t go over safety with the customer. Those are some great tips. I don’t like anything near my eyes, so I would never try to change the color of them. My friend was there at consplay, she had a blast.